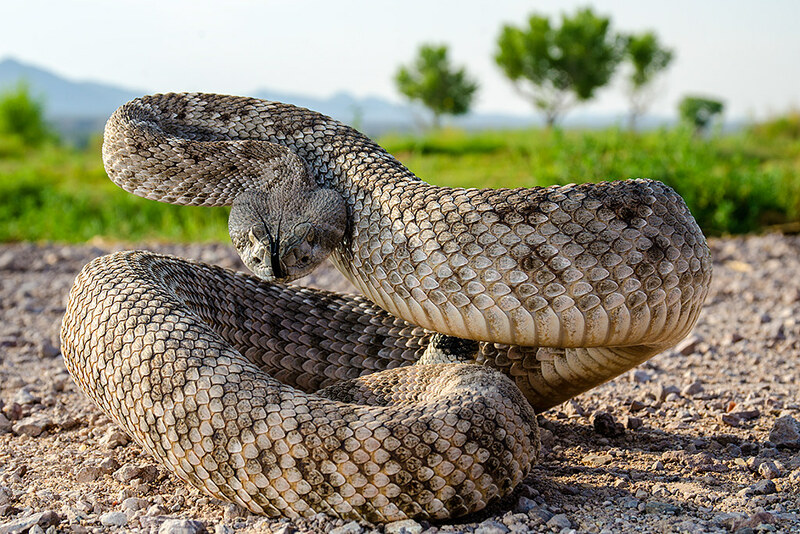 Despite the fact that the majority of herpers eschew their use, there is no single better way to increase the sharpness of your photos than by using a good tripod and good technique. Yes, I know we now have lenses and camera bodies with image stabilization, camera sensors keep getting better and better at high ISOs, and we have a choice of high speed lenses available. None of that negates the advantages of using a tripod. Image stabilization buys us at most two or three additional stops compared to hand holding without image stabilization. You’re still not going to be able to hand hold a 300mm lens at 2 seconds, (or even 1/15 second for that matter). My current camera has amazing image quality out to about ISO 800, but as good as it is at 800, it’s still much better at 100. 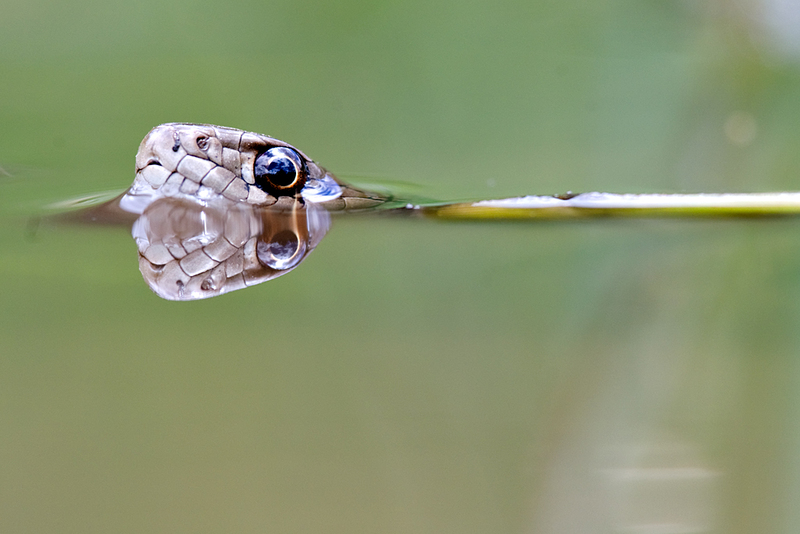 And while high-speed lenses are great for sports and some wildlife, the small size of herps means we usually need to stop down a bit for some depth of field. Now, I also understand that sharpness isn’t everything in a photograph. If it were museums and galleries would be filled with enlargements of lens test charts instead of real pictures. However, most people looking at herp photos want to see all the detail in scales and flecks of pigment that herps exhibit, and a soft image isn’t going to show that. Tripods help in other ways too. How often have you been shooting at high magnification with a macro lens and found yourself moving the lens in and out of focus as you breathed? A tripod will solve that. How about having your arms start shaking as you try to hold a camera in position for an extended period time waiting for a herp to display some desired behavior? Tripods take care of that too. Like using HDR with high contrast scenes? A tripod will give you perfect registration with your bracketed frames. Ever download your pictures to your computer and found that the once in a lifetime shot you thought you nailed has an out of focus blade of grass right over the animal’s face that you didn’t see while shooting? Slowing down with a tripod and being able to carefully examine the image from edge to edge will help with that. Using a tripod allows you to more carefully compose your photographs too. So if tripods have all these advantages why do so few of us use them? I think it comes down to a perception that tripods are heavy, inconvenient, and cumbersome. However, this need not be the case if you chose well when selecting a tripod. An ideal field tripod needs to be lightweight and compact enough to be easily carried, perhaps while strapped to the backpack that carries our camera gear. It needs to be very stable, (using a cheap flimsy tripod may actually be worse than using no tripod at all). It needs to be quick and easy to set up and use. It needs to be able to get down low to the ground, after all that’s where most of the herps are. And I prefer a tripod that comes to my eye level when standing. You might not use it much that way for herps, but if you also shoot birds and mammals or landscapes you’ll appreciate not having to stoop over all the time. I think I’ve found a tripod that meets all of these criteria- the Gitzo GT3542LS. I’ve been using Gitzo tripods for about two and a half decades now. My first Gitzo was a Studex Performance 320 with a five-inch center post that I used for 20 years. When it finally developed some problems needing repair I sent it into Manfrotto, (the distributer of Gitzo tripods in the US). Parts were no longer available for my tripod, so Manfrotto offered me a 35% discount on the price of a new G1340, which was very close in specifications to my old 320, but without any center column at all. I took the offer, and the G1340 had been my tripod for the past five years. The G1340 had all of the desirable features for a field tripod listed above except for one, because its made of aluminum, it is not lightweight. In fact I’m convinced that if I were to do curls with this thing while walking around in the field I’d have guns to rival Rocky Balboa’s. Despite the potential loss of beefiness to my arms, I decided recently to treat myself to a carbon fiber tripod and I chose the Gitzo GT3542LS. Carbon fiber has a couple of important advantages over aluminum. The first is that it is considerably lighter. My old G1340 weighed 6.4 pounds compared to 4.3 pounds for the GT3542LS. The other advantage of carbon fiber is that it has better vibration dampening characteristics than equivalent aluminum tripods. So for example both the G1340 and GT3542LS are series three tripods, (in Gitzo speak this means that the top leg section diameter on both is 32mm), but supposedly using a series 3 carbon fiber tripod is equivalent to using a much heavier series 4 or 5 aluminum tripod. If you look at it from that point of view the weight savings is even better than the 2.1 pounds indicated above. Gitzo recommends series 3 carbon fiber tripods for lenses up to 400mm, though I know of photographers routinely using them with 500 and 600mm lenses. The 3542LS is probably slight overkill for my longest lens, (a 300mm f4), and I could have gone with a series 2 tripod to save even more weight, but there was no cost advantage to going with the smaller series and I’d prefer to be prepared if I ever do buy or rent a longer lens. 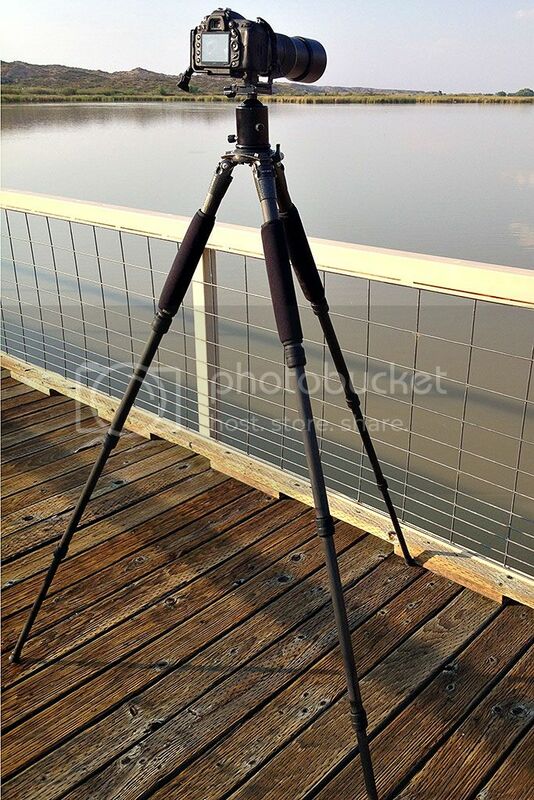 The GT3542LS is a four-section tripod. Four section tripods have the advantage of collapsing down to a smaller size than equivalent three section tripods. When collapsed the GT3542LS is just shy of two feet long. My old G1340 on the other hand, was a three-section tripod and was about half a foot longer when collapsed. Do to the smaller collapsed size and lighter weight I find that the GT3542LS rides very comfortably attached to the side of my F-stop Loka camera backpack. The tripod head does stick up above the pack though, and it occasionally snags on low branches as I walk underneath them, (remember you need to add the weight and height of your chosen head to all the measurements I’ve quoted). The G1340 never felt comfortable strapped to the backpack and I always ended up carrying it in my hand or slung over my shoulder. One potential disadvantage of a four-section tripod is that they are theoretically less stable than equivalent three-section models. This is because the bottom most leg section has to be small enough in diameter to fit inside the third leg section. When the tripod is fully extended a four-section model is being supported by thinner legs than an equivalent three-section model is. However, I figured since I was gaining stability by switching to carbon fiber I could afford to give some up by going with a four-section model. In addition the new Gitzo tripods increase stability by using what is referred to as G-lock. 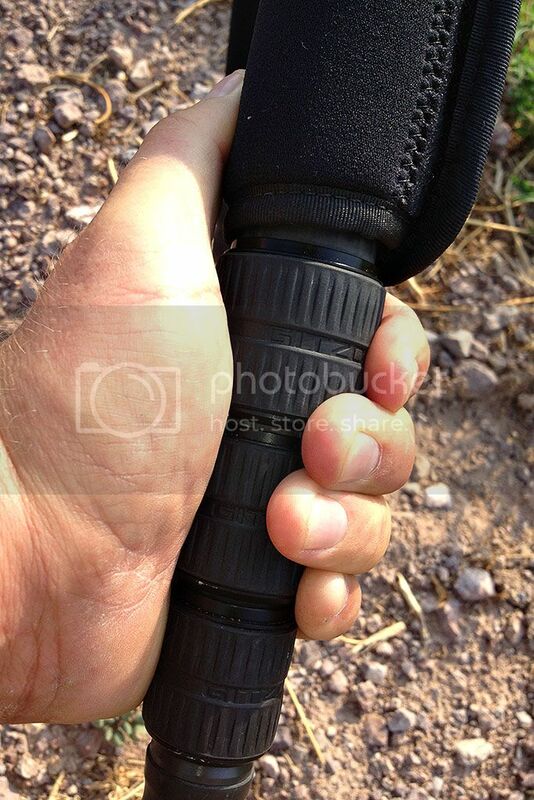 According to Gitzo the leg locks actually become more stable as the weight on top of the tripod is increased. Another potential disadvantage to three section models is that they take longer to set up fully extended, (you have three more leg sections to deal with after all). However, I find the GT3542LS is actually much faster to set up than the G1340 was because of Gitzo’s anti-rotation leg locks. On older model Gitzos the leg sections could rotate inside one another. This meant that in order to fully extend the tripod you had to first extend the top section, then tighten it enough so that you could loosen and extend the lower section. The G1340 had wing collars on the top sections that made adequately tightening them pretty easy, but on my old G320 you would sometimes go to loosen the lower section and find it spinning because you hadn’t adequately tightened the top section. With the new models the legs don’t rotate at all, so you can actually loosen all sections simultaneously, (if you have large hands like me), extend them, then tighten them in any order you desire. In addition it now takes only a quarter turn to go from completely tight to completely loose. I love these new leg locks as much as I do the lighter weight! While we’re on the subject of leg locks I am happy to report that Gitzo appears to have effectively dealt with the one complaint I had about their tripods. 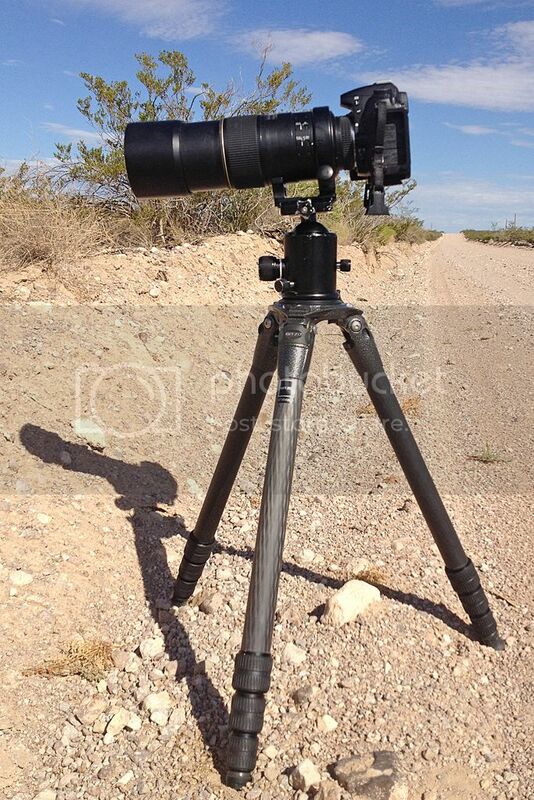 As you’ve probably figured out from the discussion so far, Gitzo tripods use twists type leg locks. Other manufacturers such as Manfrotto use lever type locks. One of the reasons I bought a Gitzo tripod 25 years ago was to get the twist locks after being frustrated with the lever locks on my old Bogen tripod breaking or loosening in the field. Twist locks are definitely more durable, but Gitzo’s older locks had an Achilles’ heel. The locks work by tightening a ring that compresses a bushing against the inside leg segment. In the older models that bushing was made of a composite material that worked great unless you got it wet. If you used the tripod in water and got the composite bushings wet you needed to fairly quickly take the legs apart, remove the bushings, and let them dry out. If you didn’t do this they would swell and lock the legs up so tight you could not undo them. I heard of photographers carrying spare sets of bushings into the field, just so they could swap them out if they got wet. On the GT3542LS the bushings are no longer made of the composite material. I have not bothered to do anything after using my GT3542LS in water and the legs work as well wet as they do dry. Also I found out that the legs are open at the top, so after using the tripod in water and then holding it upside down the water drains out of the tops. Just a little warning since the first time mine did this it drained onto the camera I had mounted on the tripod! Fortunately no harm was done to the camera and the good news is that the legs should dry out much faster than the old ones. The GT3542LS is part of Gitzo’s Systematic line of tripods. Systematic tripods are sold with a flat plate on top, which has a 3/8-inch bolt for mounting the tripod head of your choice. There is also a hook underneath the plate from which you can hang your camera bag or other weight to gain more stability. I’ve never actually done this, but I imagine it could be useful if your using a light setup in the wind. The plate can be swapped out for various center columns or a video bowl, but for herps you want the standard flat plate. With the flat plate on you can splay the legs to almost 90 degrees and get the tripod down to 3.7 inches from the ground. You want this feature for herps! There are other methods of getting a camera on a tripod close to the ground, such as center columns that can be mounted vertically or even hanging the camera upside down from a center column between the tripods extended legs, (I cant quite picture how that works!). The most convenient and stable way of doing this though is to use a tripod that will get down low and allow you to use the camera in its normal orientation. The LS in the tripod’s name is Gitzo’s designation for an “eye level” tripod. This means that when fully extended, with a head and camera mounted, the tripod will be at approximately eye level for the average adult. I’m 5’9” and with my Kirk BH-1 ballhead my Nikon D7000 is at my eye level if I stand on my tiptoes. If you are six feet tall or taller, or if you shoot frequently standing on hillsides Gitzo offers an XLS version that gets quite a bit taller, but is heavier and not as compact when folded. One neat feature for me is that when the legs are all collapsed the tripod is just about the perfect height for me to sit behind. I like this because I’ll often sit on the ground and watch and photograph lizards and its kind of nice having the tripod be just at the right height for that as soon as I take it off the backpack to shoot. The tripod comes with metal spikes that have rubber caps on them. It also comes with a set of snowshoes that can be put on in place of the rubber caps if you’re going to be working in the snow! 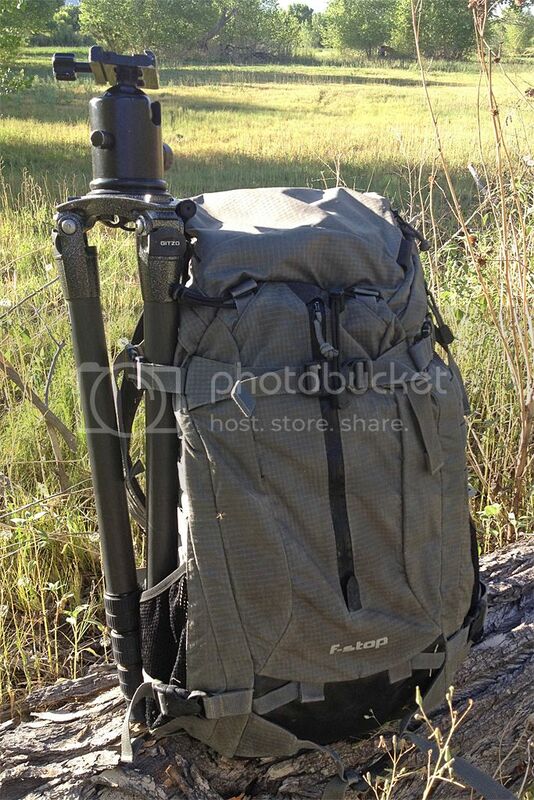 Gitzo includes a thin bag that I can’t imagine actually using except perhaps to store the tripod in a closet. There is a complete maintenance kit as well that includes tools, a complete set of replacement bushings, and a tube of grease for the leg locks. Nice extra touch Gitzo! 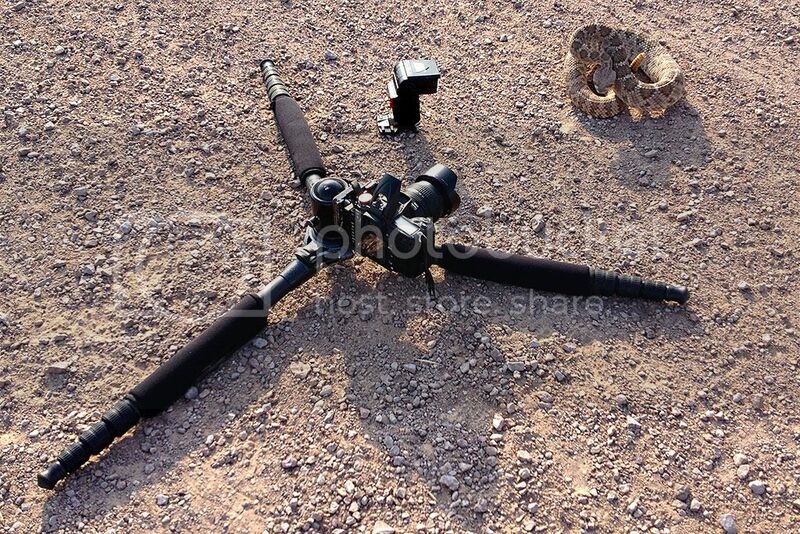 I think I may have finally found the perfect herp tripod. It does have one disadvantage though- Gitzos aren’t cheap. The GT3542LS sells for about $850 from retailers like B and H. That might seem like a lot, but think about how much you paid for your last camera body and a good tripod is going to outlast several of those!